You can use coconut oil for seemingly anything - and I do; I even joke that I think coconut oil is the answer for just about everything. My whole family is actually obsessed with coconut oil and my Mom has to buy a giant tub of it at Costco for all of us. While it's great to cook with I always keep a container of it in my bathroom too because as I'm sure you can guess my favorite way to use this magic oil is for beauty. 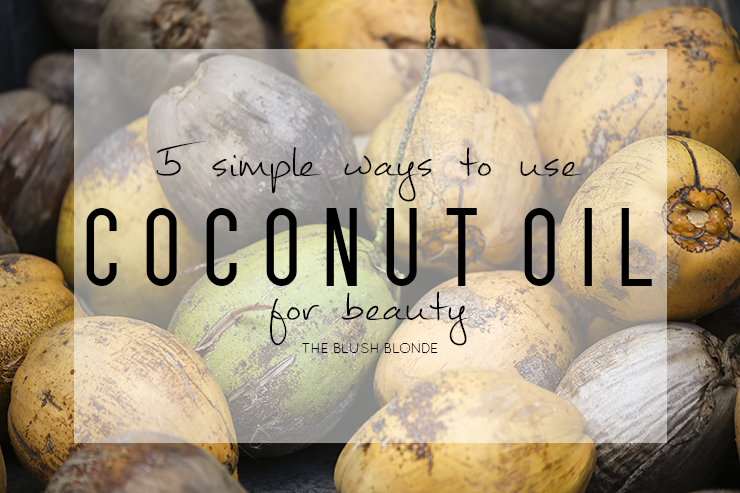 Since it has a million different uses it's a great way to add more natural products to your beauty regimen and today I have for you five very simple ways that you can incorporate coconut oil into your beauty routine. I think the most obvious use for coconut oil in beauty is as a moisturizer for your body. Using coconut oil on your body is especially helpful during the winter months when skin tends to be significantly drier. You can use it as a spot treatment for areas that are extra dry or you can apply it head to toe. My favorite time to use it as a moisturizer is after a shower; if you shower at night pat your skin dry to leave some moisture behind and then apply coconut oil all over your body, including your feet, allow it to soak in for a few minutes before putting on your clothes for the softest skin of your life. Coconut oil can be used alone or combined with other ingredients (like it is here) to make an intensive hair treatment. Using a coconut oil hair treatment will bring life back to dry hair, making it softer, shinier, and healthier. There are a few different ways I like to put just coconut oil in my hair, I usually either rub it into the ends at night before I go to bed when I know I am going to wash my hair in the morning or I section my hair and saturate each individual section with coconut oil for a really intense treatment. You can use coconut oil to wash your face as a natural and inexpensive alternative to oil cleansers. If you're not sure about an oil cleanser remember this, coconut oil works to gently break down the oil in your skin without drying it out. To use it as a cleanser you will need coconut oil, and a wash cloth. Take enough coconut oil to cover your face, rub it between your hands to warm it so that it becomes a liquid, and apply to your face, massaging in a circular motion. Wet the washcloth with the warmest water your skin can handle, and wring it out. Take the damp cloth and lay it over your face for thirty seconds to one minute; this steams your skin and allows the pores to open up. Remove the cloth and gently scrub your entire face with it in a circular motion. Finish by splashing some warm water on your face. Pat skin dry, then use toner & moisturizer as normal. Everyone suffers from dry cuticles from time to time and coconut oil is the natural alternative to cuticle oils you see in stores and at beauty salons. I like to take a little coconut oil and rub it on my cuticles at night before bed so it can soak in overnight. This will help to prevent dry, cracked, and peeling cuticles, which are never cute! If your eye area is feeling particularly dry swap your regular eye cream out for coconut oil for a few days. Warm a tiny bit of the oil in the palm of your hand, dip your (clean) ring finger in the oil and gently tap it along the eye area. Doing this is sure to bring the skin around your eyes back to life and is great to do from time to time to keep everything moisturized. Do you use coconut oil in your beauty routine? If you do let me know below, I'd love to hear how you use it! It really does work for everything!! I haven't ever used it, but I feel like I should buy a jar and start! There are just so many uses for it! I use coconut oil for my hair and skin but i haven't used it as a cleanser yet. Coconut oil is such a miracle product! I've never thought of using it as eye cream! What a great idea!! I have been wanting to start using this for so long now. I need to just buy it already haha! I never knew about using this as a cleanser...I use it as a eye makeup and mascara remover..i must try!! I am always tempted to pick up a massive thing of coconut oil on my visits to Sam's Club... You have convinced me that it's a good idea!